In the Segregated Deep South, When Lynching and Klansmen and Jim Crow laws ruled, there stood a line of foot soldiers ready to sacrifice their lives for the right to vote, to enter rooms marked 'White Only,' and to live with simple dignity. They were called Freedom Riders, and Thomas M. Armstrong was one of them. This is his story. Thomas Armstrong's decision to join the 1961 Freedom Rides secured his place in history as the first Mississippian to do so. His commitment to make a difference and speak out against injustice was reinforced by his experiences as a student at Tougaloo College, where the significance of education to promote transformative change is so well evidenced. An oasis of freedom and intellectual ideals, Tougaloo College continues to prepare its students for lives of meaning and to use their education to effect change in a global economy. Known as the 'Cradle of the Civil Rights Movement in Mississippi,' Tougaloo College is the place to which people from across America came to devise the strategies to improve race relations in Mississippi. The college became—without regard to race, ethnicity, gender, or religion—the safe haven and refuge from the raging storm of racism that permeated the state of Mississippi during that period in history. From the sanctuary of its Woodworth Chapel, strategies were devised to change the social, political, and economic fibers of the state of Mississippi; strategies that would ultimately impact the nation, creating a model for those fighting for democracy worldwide. Such was the influence of a Tougaloo education for the students of that time who were charged with the responsibility to make a difference. From the Tougaloo Nine to the Freedom Riders, the civil rights movement was significantly influenced by the young peoples' engagement. The youth of today is not much different from those of yesteryear. They want to believe that their generation can also make a difference and are inspired to do so. They, too, are seeking opportunities to grab onto a cause bigger than themselves. Young people became engaged in helping the victims of Hurricane Katrina: they flocked to New Orleans and the Mississippi Gulf Coast to volunteer at the shelters and to assist with the rebuilding efforts. They became engaged in the presidential campaign of President Barack Obama and voted in record numbers for change. They realized that their votes mattered and they could make a difference. The lessons of the past must be shared with young people today, to enable them to understand conceptually and contextually the difference each succeeding generation can make, and their responsibility to advance the ideals of a democratic society. Thomas Armstrong's story will inspire them to find their places of impact and influence. There are valuable lessons to glean from Thomas Armstrong's life as a Freedom Rider and foot soldier for justice and equality. His journey is an example of students' social activism and how it influenced a movement that broke through the walls of segregation, destroyed the barriers of Jim Crow, and gave wings to a movement that resulted in African Americans' rise to full citizenship in the Deep South under the law. While the highly emotionally charged civil rights era has passed, there are indeed important lessons that are instructive for educators and students today. Along with uncompromising academic preparation, students must also prepared to meet the challenges of informed citizenship, to be sensitive and committed to the issues of justice, and to develop the quality of character that is essential for productive participation in the global society. 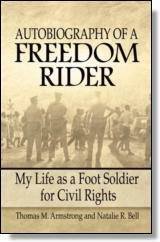 Autobiography of a Freedom Rider will help encourage and inspire the next generation to continue constructing the path toward a true and inclusive democracy. Thomas M. Armstrong III is a veteran of the early 1960s civil rights movement in his native Mississippi. He was at the forefront of early protests led by black Southerners for voting rights and equal public accommodations from 1958-1961, resulting in threats that had him running for his life. Mr. Armstrong moved to Chicago where he has resided since 1964. He remains closely allied with other former Freedom Riders and civil rights workers around the country and often speaks at schools and civic organizations such as the African American Leadership Roundtable in Chicago. He has been the subject of scholarly research by respected academics, sought after for major media interviews, and featured in print from critically acclaimed books to a Forbes magazine publication. The documentary Freedom Riders will be broadcast nationally on PBS in May 2011 and has been pre-screened at locations around the country from New York to Denver to Los Angeles. The movie is receiving rave reviews and Mr. Armstrong will be a featured panelist at well-publicized events where he will promote his memoir Just a Foot Soldier. Natalie Bell is a journalist based in New York. She has worked for more than 25 years as a news reporter for broadcast and print news organizations in the Northeast, Midwest and Southern U.S. Her work has been carried by national and international news organizations, such as Dow Jones & Co. and National Public Radio. She is specialized in covering public affairs, in particular education. As a Fulbright-Hayes fellow, she covered political and cultural transition in post-apartheid South Africa. She was a delegate to the United Nations World Conference Against Racism in 2001. She has also taught journalism and media studies as an adjunct professor. Bell has family roots in Prentiss, Mississippi, and met Armstrong while researching her family history. She is a native of Nashville, Tennessee, and has lived and worked as a television news reporter in Mississippi.